Oktoberfest Scoop Ennis Czech Boys are in the lineup in Fredericksburg this weekend. Be among the first to buy their new CD You Have the Right to Polka! You can also order online. It’s an impressive lineup for the 32nd annual fest with 24 bands (at least that’s how many I counted). There’s always room for one more! Thomas Durnin with the Czech Melody Masters band and host/producer of Czech Melody Time on KOOP 91.7FM of the Czech Melody Masters told polkabeat they have been signed on to close out the fest from 4-6 PM on Sunday. Festival Coordinator Debbie Farquhar says you’ll also want to check out what's new at the fest this year. "One is Strassen Zelt (street tent) located on Adams and will seat over 200 people. Strassen Zelt will have Oktoberfest souvenirs, Paulaner beer, wurst and cheese, a photo booth, German Schuhplattler performances on Saturday and Sunday and our 3rd Annual 42 tournament on Sunday," Debbie says. Prost y'all! New Texas Czech Polka Show Danny Zapletal now has a Texas Czech Polka Hour to complement his Czech Polka Show broadcast on Saturdays from 1 to 2 PM at WRJQ. 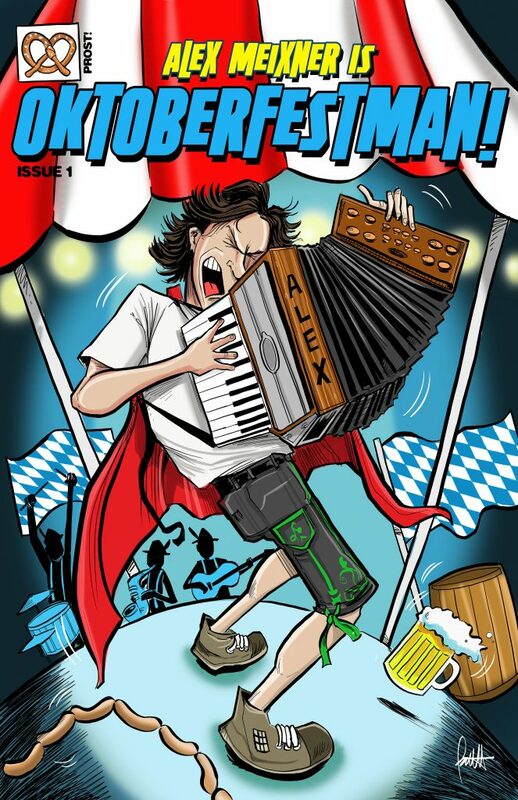 The new Texas Czech Polka Hour follows from 2 to 3 PM. It was bound to happen. There is just too much good Texas polka music that deserves its own hour! Congrats Gold ’N Crisp & the Plumber in the Family Congratulations to Sidney and Emily Cernoch and Phyllis Cernoch Chavarria on the 40th anniversary of the Gold ’N Crisp in La Grange. Uncle Sidney says he remembers their first customer, a young lady on her way to start college at UT. They tried contacting her, but have since lost touch. I’ve always thought it was the best fried chicken in Texas and then lo and behold the Best of Fayette County Awards are announced and GNC is chosen for best hamburger. Wow! Best chicken AND burgers. Also congrats to cousin Daniel, his wife, Rose, and everyone at Cernoch Plumbing, voted Best Plumber in Fayette County. Great Idea The hardest working man in polka, Alex Meixner, is always thinking. His latest brilliant idea was to record Stand and Sing Ein Prosit, an ep (a short CD with only 6 songs) with proceeds going to the Wurstfest Scholarship Trust. "I feel it’s very important to support the scholarship so more young people will have the opportunity to study and continue the traditions of German culture, music and language here in the U.S. Buy yours today for only $5 and support the promotion of polka and education at the same time! Speaking of Wursfest It will be here soon. Wurst Director Herb Skoog says the Wurstfest tickets are in the mail. Watch for your chance to win them in the Polkabeat Weekend Lineup newsletter. New this year, Herb says, is an all-girl band from Munich. Das ist wunderbar! Check out the schedule of events. Just Added Jerry Haisler told polkabeat that he, Alfred Vrazel and their friends will jam on the patio at Ratibor Country Grill in Temple this Saturday, October 6 from 7-10 PM. Polka on! Nearing a Sellout Vernell Foyt at SPJST Lodge 88 told polkabeat that she has only three tables remaining for the Red Ravens dance on Saturday, October 13. Contact the lodge and make your reservation today!